HORRIFYING! Raining Spiders In Brazil. Most could honestly say that this is their WORST nightmare come true! Cloudy with a chance of ….spiders! Erick Reis captured this creepy crawly footage as he was leaving a party he was attending. At first glance he thought they were birds in the distance, but a closer look revealed a more terrifying truth. The spiders were crawling up and down silk threads attached to telephone pole wires and trees. 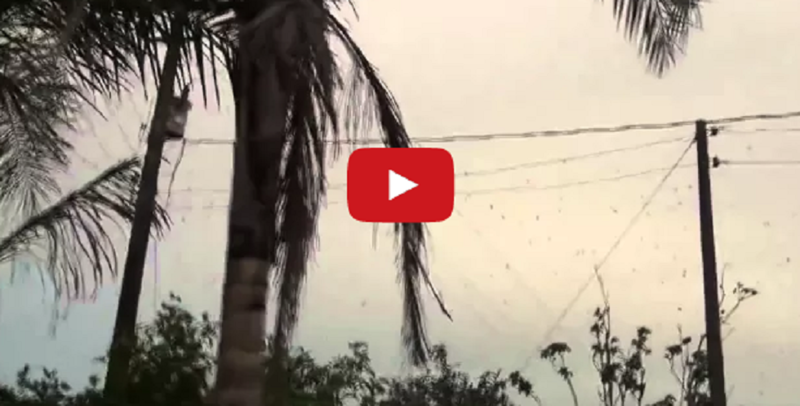 The footage gives the impression of spiders falling from the sky. As scary as it seems, it turns out that this is a common occurrence with this type of colonial spider, which is quite social and lives in large communities. SHARE this with your friends that hate spiders!